All my flights with Srilankan so far were of short duration- Chennai-Colombo, Colombo-Male and Colombo-Gan Island. These sectors are mostly served on narrow body A320 (with occasional exception of A330) and is too short to experience anything. A light snacks- sandwich is served and often they won’t even have time to serve coffee as descent would begin within an hour of take-off. 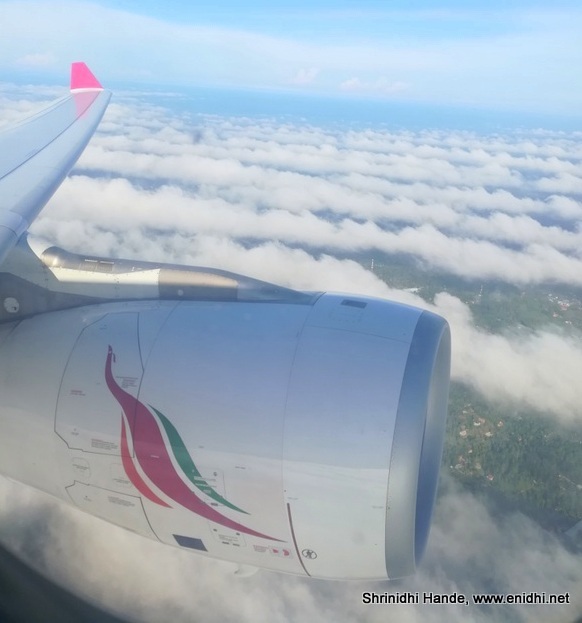 Previous post on Srilankan short haul experience here. But recently I got to experience their long haul flight between Colombo and Beijing, served by A330-300. Though I’ve had multiple long haul flights this year- Auckland, Gold Coast etc) they were with LCCs, without food, entertainment or any other comfort. [AirAsia X Auckland experience] My previous long haul flights on a full service airline were Lufthansa, Air France etc couple of years ago. Hence I was looking forward to the Srilankan flight to Beijing- hoping to have a relaxed flight with couple of meals and probably a movie or two during the 6.5 hours flight. Srilankan A330 has 2+4+2 configuration, which is much better than Air Asia’s 3+3+3 configuration, which tries to pack one per person per row. There won’t be any need to pass 2 people in the 2+4+2 configuration. If you can get your seat in the 2 seater portion, your trip will be fairly comfortable. Food: I was expecting two meals- one after take-off and one before landing. 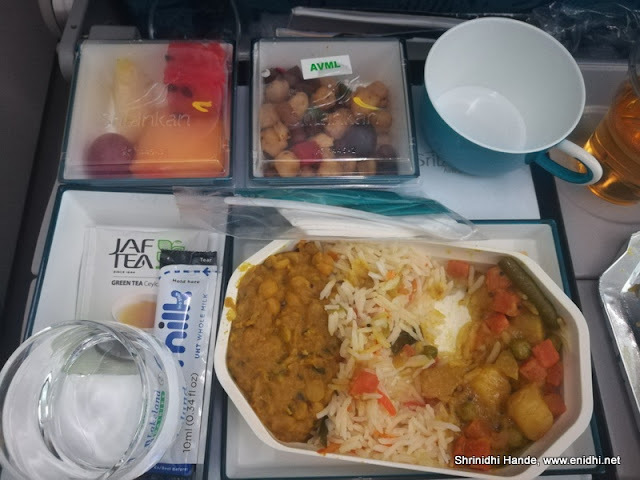 But we were served only 1 full meals after take-off and a light snacks before landing. 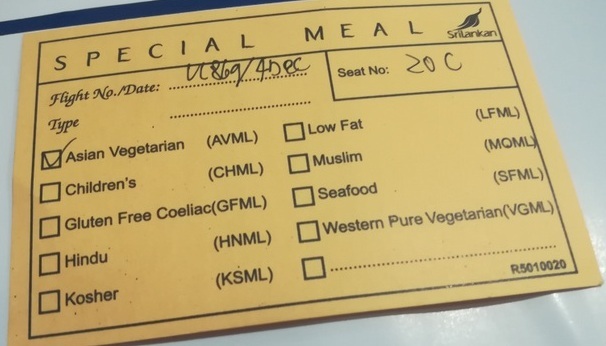 Since the flight is only 6.5 hours long, technically speaking Srilankan is justified serving only one meal. But then, from my point of view, I boarded at about 1 PM, it was 11 PM when we got off the plane, so I was under Srilankan’s care for half a day. It would be midnight when we reach our hotel from airport and finding dinner at midnight is difficult- so if Srilankan had served dinner as well it would have been super great. But obviously airlines need to watch their cost and can’t afford to be too generous. Food was fine- my vegetarian meal was served upfront so I didn’t have to wait. I noticed that instead of rolling the cart in the aisle, crew personally carry the meals in hand and serve the guests, which takes a bit more time if you’re in the back, but feels lot personal. Collection of empty tray took longer than usual. Entertainment was fine. I watched a few movies. Headphone was provided (they are not provided on short haul flights). But before each video we’ve to see an announcement that we should watch our belongings as there have been reports of thefts and a long ad video. It can be skipped using forward bar. Compared to a low cost carrier like AirAsia X, full service airline crew have lots more work in their hands- they have to distribute pillows and blankets, issue n collect headsets, serve drinks at regular intervals, serve meals, collect blankets and so on. Srilankan crew did very good job of servicing the 300 odd guests. The check-in counters at PEK were a mess. No separate counter for those who have done online check-in. Every 3rd passenger has an argument with staff- either they have too many bags or too heavy bags. With check-in counter staff's English not being that good, conversations often lead to frustration and delay. Many people make friends while waiting in check-in line- mostly with people from their own state/language and by the time they reach the counter their friendship gets so strong, now they want to sit together in the plane-so staff now has to find them a seating together! On the return leg, Beijing to Colombo, I chose seat 20C for its extra leg room. Got a bit extra leg room, but realized that leg room varies aircraft to aircraft- the next flight- Colombo-Chennai, also served by an A330, had more leg room due to a slightly different positioning of bulkhead. Problem with row 20 are that the arm rest that doesn’t move and entertainment screen that needs to be stowed during take-off and landing. Some compromises for a more comfortable leg room. Return flight arrived from Colombo 30 minutes ahead of time, but our return flight was delayed by 30 minutes due to some ATC issues. Only one breakfast was served and nothing much- most guests slept during the flight. Overall it was fine. Despite some minor shortcomings, thanks to Srilankan for facilitating my China trip in budget. Staff are friendly, aircrafts are decent and service is fairly reliable. They do fly to various destinations long haul- London, Melbourne, Seychelles, Beijing, Shanghai, Tokyo Narita etc. If the ticket fares are tempting, then I would suggest booking on Srilankan without any hesitation. Waiting for their next 50% off sale to decide where else I can book next. WOW Air India flight begins!